Far East Energy Corporation (FEEC) was formed to acquire explore, develop, and produce, oil and gas, with heavy emphasis on coalbed methane which has emerged as a lower cost/lower risk/higher return resource. Our world headquarters is in Houston, Texas, and we have satellite offices in Beijing and Kunming, China. Far East Energy began operations on December 31, 2001. The company's early efforts focused on the evaluation of domestic and global opportunities to develop natural gas and coalbed methane (CBM) natural gas properties. 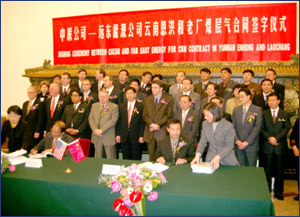 Upon the completion of substantial examination and due diligence for CBM opportunities, FEEC, on January 25, 2002, entered into two Product Sharing Contracts with China United Coalbed Methane Corporation, Ltd. (CUCBM), which has exclusive authority over all coalbed methane gas in China. FEEC and CUCBM will jointly explore, develop, produce and sell CBM in a total area of 1073 square kilometers, in Enhong and Laochang areas of Yunnan Province, People's Republic of China. It is estimated by the Yunnan Provincial Coal Geological Bureau that the joint venture area contains total gas-in-place in excess of 5.3 trillion cubic feet (Tcf) of methane gas. Far East Energy Corporation has the right to earn a minimum of 60% interest in the joint venture (with CUCBM having the election to participate and share in costs and production up to 40%). 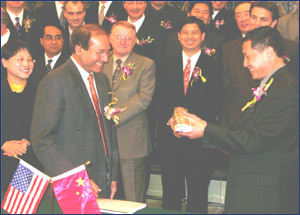 On June 17, 2003, Far east acquired its preeminent holding, obtaining two farmout agreements from ConocoPhillips, covering over one million acres in the Shanxi Province of Northern China, in what could prove to be the world’s largest coalbed methane project. Based on estimates by ConocoPhillips and Yunnan Provincial Coal Geology Bureau all of Far East’s project areas in China combined potentially contain 18.3 Tcf to 24.9 Tcf of total gas-in-place. Using a conservative recovery rate of 50%, recoverable CBM resources are potentially 9.2 Tcf to 12.5 Tcf (FEEC’s share is 4.8 Tcf to 6.9 Tcf depending upon CUCBM and ConocoPhillips participation). We received final approval of the farmout agreements from the Ministry of Commerce in China, in March 2004 and we are now proceeding with testing and drilling programs. 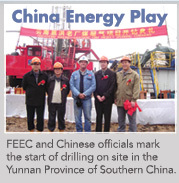 We spudded our first well on the Enhong-Laochang coalbed methane block in Yunnan Province on October 26, 2003. The FCY-LC01 reached total depth of 825 meters (2,722 feet) on November 30, 2003. A total of 15 mineable coal seams were penetrated during the drilling of the well, with a total thickness of 29.40 meters (97 feet), which we consider to be excellent. The coring of the coal samples showed a recovery rate of 94.8%. In addition, the drilling revealed four targeted major coal seams with a total thickness of 16.30 meters (54 feet), all within an interval of about 110 meters (363 feet), which we believe are favorable for fracturing and production of CBM. Testing of 18 desorption samples from the well resulted in gas content estimates of approximately 650 cubic feet per ton of coal. On February 18, 2004, we concluded drilling our second well in the Enhong-Laochang Block and began conducting desorption testing. Total depth of this second well reached 420 meters (1344 feet), penetrating 15 coal seams with a thickness of 16.7 meters (53.4 feet). The total thickness of the coal seams targeted for potential production was 6.6 meters with a recovery rate of 70%. Estimated gas content, based on preliminary desorption results is approximately 10 cubic meters per ton of coal, or about 350 cubic feet per ton of coal. On April 7, 2004, we concluded drilling our third well (“the FCY-EH01”) in the Enhong Block in Yunnan Province near Shang Sheshui Village and began conducting desorption testing. Total depth of this well reached 435 meters (1436 feet), penetrating 42 coal seams with a thickness of 42.8 meters (141 feet). The total thickness of the four coal seams targeted for potential production was 17.2 meters (57 feet). Estimated gas content, based on preliminary desorption results, is approximately 8-10 cubic meters per ton of coal, or approximately 280-350 cubic feet per ton of coal. By comparison, some of the more prolific CBM basins in the United States have lower gas contents, such as the San Juan Basin in New Mexico, which has gas content of 300-700 cubic feet per ton of coal, and the Black Warrior Basin in Alabama which has gas content of 250-500 cubic feet per ton of coal. The term of the Enhong-Laochang production sharing contract with CUCBM consists of a two-phase exploration period, a development period and a production period. Under our Phase I requirements of the exploration period, we completed the drilling of two slim hole vertical wells during the first quarter. On February 25, 2005, we committed to begin Phase II, which requires that we begin drilling one horizontal well with a minimum of two laterals by December 31, 2005. Following completion of Phase II of the exploration period, we may elect to continue the production sharing contract and conduct development and production operations on any CBM discoveries. The development period as to any CBM field in the Enhong-Laochang project will begin after the approval of a development plan submitted by us with respect to that field by the State Council of the PRC and confirmed by CUCBM. The production period as to any CBM field in the Enhong-Laochang project will begin after the date of commencement of commercial production of that CBM field. Our agreement with CUCBM expires 20 years from the start date of the production period of the Enhong-Laochang project. We serve as operator under the production sharing contracts to develop the Shouyang Block and Qinnan Block in the Shanxi Province. The term of the production sharing contract with CUCBM consists of a three-phase exploration period, a development period and a production period. We committed to begin Phase II, which requires that we drill two horizontal wells in the Shouyang block by December 31, 2005. We have agreed to use our best commercial efforts to drill each of the horizontal wells to 4,000 meters in coal seam with a minimum requirement under our farmout agreements of 2,000 meters drilled in coal seam per well. If we elect to commit to Phase III we will be required to drill one horizontal well, under which we will attempt to drill to 4,000 meters in coal seam. We are required to complete Phase III by July 1, 2007. Our total work commitment in Phases II and III, if we elect to commit to Phase III, will consist of a total of 12,000 meters of horizontal drilling in coal seam for the three wells completed during the exploration period. Following completion of Phase III of the exploration period, we may elect to continue the production sharing contracts and conduct development and production operations on any CBM discoveries. The development period as to any CBM field in the Shanxi Province will begin after the approval of a development plan submitted by us with respect to that field by the State Council of the PRC and confirmed by CUCBM. The production period as to any CBM field in the Shanxi Province project will begin after the date of commencement of commercial production of that CBM field. Our agreement with CUCBM expires on April 1, 2034.